Those who have been looking for a recreational mountain ranch for a while know that while many properties are available in the Rockies, it is difficult to find that place that has that “right” mix of topography, accessibility, views, proximity to offsite recreational opportunities, water, wildlife, and last but not least price to make it the one that family and friends will want to visit and enjoy time and time again. Finding the right property for a full time ranch residence and agricultural operation is if anything more difficult, properties either tend to be so isolated clients and customers can’t find it or so expensive that the economics simply won’t work out. The “Gold Pan Ranch” in the central Colorado Mountains is a unique and seldom encountered opportunity for either use, or a combination of both. 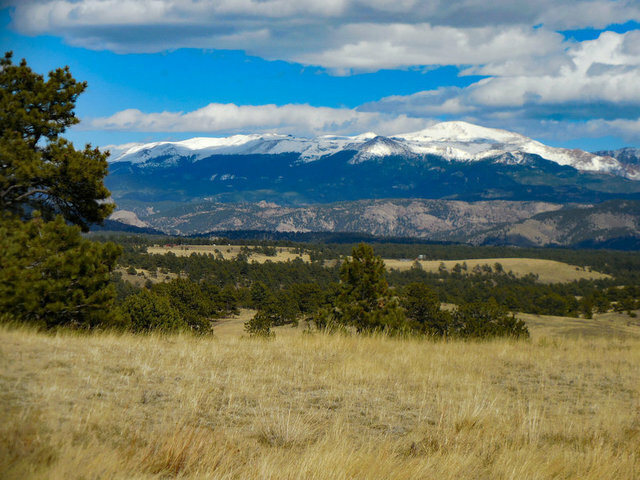 The ranch is located on the southwest side of Pikes Peak, a mere hour and a half from Interstate 25 and the Colorado Springs airport. It only two and half hours from Denver International Airport and all of the social and business opportunities Denver offers. Yet, the area around the ranch is very rural. The all-weather, paved road that leads to the gate of the ranch has traffic measured in the dozens of vehicles per week, not hundreds per hour. The temperate climate grasses that cover the land are high in nutritional value for domestic animals, as well as for the large number of wildlife species that inhabit the area. Grazing on the ranch has been well managed for decades now, there is no evidence of overgrazing and little intrusion by noxious plant species, which is a major reason why the place is home to mule deer, antelope, turkeys, blue grouse, cottontails, and most of all elk, who can be seen on the property in groups of over a hundred especially during the fall mating season, which of course happens to coincide with some of the bull elk hunting seasons! In fact, drawing an elk license is not necessary for three of the regular rifle elk seasons, one can simply purchase an antlered elk license over the counter. The ranch includes an entire mountain, McIntyre Mountain and the top of another, Castle Mountain. Except for the areas leading up to the mountain peaks, topography is slight to moderately sloping. Primary tree species is Ponderosa Pine, with some aspen and spruce. There are several small erosion control ponds on the property, full at intermittent time, and several live springs which are active and produce a lot of water for livestock and wildlife. The ranch does have that feature everyone desires, live running water in Four Mile Creek, which runs through the meadow between the ranch headquarters and the public road. AND, water rights are included that permit irrigation of the meadow from the water in the stream (in compliance with water right regulations). The meadow portion of the ranch is about 150 acres, and surprisingly in the mountains is level enough that a former ranch owner had a landing strip for a private plane near the ranch house. The ranch itself comprises 1877 acres more or less, all fenced with some cross fencing. One can drive all the way through the ranch in a pickup or suv without using four wheel drive unless its muddy or snowy. From the ranch it is half an hour to casino gambling and restaurants in Cripple Creek, one and a half hours to world class skiing at Breckenridge, one hour to white water rafting and fishing in the Arkansas River, and about 45 minutes to the excellent fishing of Eleven Mile Reservoir.